Lucy is reading a murder mystery to her husband when Fred and Ethel overhear a bit of dialogue: "Hit me, I dare you!" Thinking the Ricardos are having a terrible spat, they phone upstairs, hoping to break up the quarrel. Ethel: "Is there anything I can bring you? Cookies, ice cream, iodine?" Moments later, Ricky playfully tosses the book at Lucy, hitting her accidentally in the eye. When the Mertzes spy the resulting shiner, they cannot accept the "farfetched" explanation Lucy offers. Taking it upon himself to patch up the Ricardos' "misunderstanding," Fred sends flowers to Lucy, but accidentally signs his own name to the card, not Ricky's. "Darling, I love you, I love you, I love you. Eternally yours, Fred," the message reads. When Lucy opens the box and sees the signature, she can't help but wonder, "Fred who?" Sarcastically, Ethel assures her it isn't Fred MacMurray, just before finding her husband hiding in Lucy's closet. Without seeking an explanation, Ethel belts Fred in the eye. He, in turn, smacks Ricky in the eye for starting the whole mess. After things have cooled down, Fred apologizes, finding the book-in-the-eye story quite plausible. In fact, he and Ethel have recreated the scene and now she, too, has a shiner. The four, black-eyed friends laugh uproariously, and everything returns to its usual state. Special Notes: This is the fourth flash back episode since "Lucy goes to the Hospital". 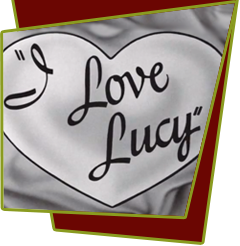 This episode is based on lucy's radio show, My Favorite Husband, Episode #117, "The Misunderstanding of The Black Eye". Bloopers: At the florist's, Fred orders some roses to be sent to Lucy in Ricky's name and adds some gladiolas to the order. However, after the flowers are delivered and Lucy opens the box, the gladiolas aren't included in the order.